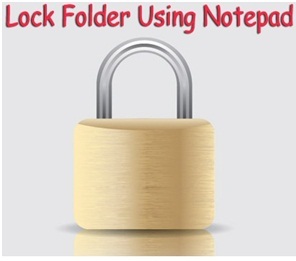 You must be using a lot of software in order to Protect your files and folders , itday I am going to tell you about a trick using which you can Lock any folder just by using notepad only. 2. In the above program I am using rightyaleft as the password of the file. You can change that to any of your desired name. 3. Save the file in the name of mylocker.bat . 4. Double click on the mylocker.bat file which you create, a new folder by name Locker will be created on the same location of bat file you saved. 5. Copy your files to this folder and open bat file again and type y and then enter to lock your folder. 6. To unlock your file again, you need to open the bat file and enter your password.